The little details are important! From the moment you are engaged, your mind starts spinning thinking about all the little details that are going to get put together to create your most magnificent day. The details help create atmosphere and establish the mood of your wedding. You have put hundreds of hours into planning all of the details of your wedding, so make sure your photographer can capture them all perfectly. Be sure to schedule enough time during the day for your photographer to capture all of your little details to help you remember just how perfect it all looked. The Shoes - Here's the chance to be a little creative and show off the fabulous shoes you found that make you feel so fabulous. The Dress - You've agonized over picking just the right one so you must show it off and let it have a photo shoot all it's own. The Bouquet/Boutonnieres - The flowers are an important focal point of the wedding and need to be shown off! 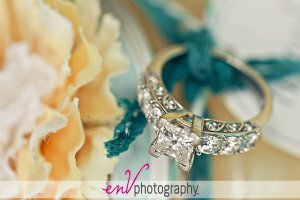 Ring Shots - The rings are the absolute symbol of unending love... so be sure to have a knock-em dead photo taken of them (and preferably not on your hands!). Let your photographer get creative here! Reception decor - A great sweeping shot of the reception room shows off just how hard you've worked to make it all perfect! Be sure to get images showing off your cake, favours, menu cards, seating charts and any other detail you've put into making the room look amazing. If you've spent time and money on it, it needs to be photographed! Your wedding day passes in such a blur, you need great photos to help you remember every last detail!